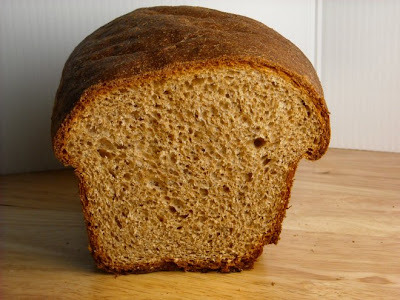 After much trial and error I have finally found my favorite recipe for Honey Wheat Bread. It is hearty and soft with a good balance of nutty and sweet flavors. It is a straight dough method which means you can just jump right in. No need for overnight fermenting or a starter. This has become my go to sandwich bread. Recipe from " On Cooking a Textbook of Culinary Fundamentals" 4th ed. 1. Combine the salt, milk powder 12 ounces (360 grams) whole wheat flour, water, yeast, honey, softened butter in a mixing bowl and mix until combined. cover bowl with plastic wrap and set in warm place for 10 minutes until yeast is frothy - I do this to make sure the yeast is working the recipe skips this step. 2. Add the remaining flour 2 oz (60 grams) at a time. Knead on medium speed approximately 8 minutes until the dough is smooth and elastic. 3. Place the dough in a lightly greased bowl and cover. Let dough ferment in a warm place until doubled. 4. Punch down, portion and shape as desired. 5. Le the shaped dough proof until doubled. Bake at 375 F (190 C) until firm and dark brown, approximately 1 hour for loaves and 20 minutes for rolls. I have found my loaves are done after 45 minutes so check your loaves as you go. Optional- brush the top of the loaves or rolls with melted butter after baking. 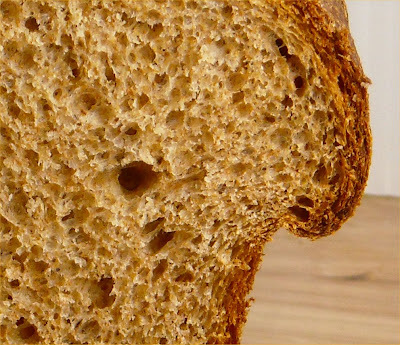 This bread is best within 3 days but it has held up well in my refrigerator for 2 weeks. It does dry out in the fridge. That does look good. I've never tried a honey wheat bread before ... maybe time to try I think! Okay... I want a slice of bread with a lot butter. Followed by a big hunk of the Chocolate Peppermint Cake.